Some of their rankings I am not sure about, but I broadly agree with the big picture. "The free world" was a valid term during the Cold War. And it is still a valid term today to describe the countries where human rights are respected, and government is changed by peaceful argument, debate and voting, rather than by force. "The unfree world" consists mainly of communist states, Islamic states and African dictators. I have moved Islamic states to a separate page. 2012: Worst of the Worst 2012: The World's Most Repressive Societies by Freedom House. Ones allied with US: Saudi Arabia. Ones with veto at UN: China. Ones supported by the western left: Cuba, North Korea, Syria. "The normal condition of mankind is tyranny and misery." After a brief, fragile experiment with democracy in the 1990s, Russia is now a non-democracy again. Vladimir Putin was the man who ended democracy in Russia and returned it to its natural autocratic and imperial rule. Freedom House summary - "Not Free"
The Economist summary - "Authoritarian"
Some people are under the impression that Russia is now "capitalist". However, Russia is ranked by the Heritage Foundation as one of the least economically free countries in the world - "Mostly Unfree" (close to "Repressed"). Freedom of religion in Russia has been restricted under Putin. Freedom of the press in Russia was mostly ended under Putin. There will not be a new Cold War or Third World War, because, unlike the Soviets or Al Qaeda, the new Russia has no revolutionary ideology it wants to spread everywhere. We should be grateful for that. The new Russia will bully its neighbours, and it will be hard for anyone to protect them. Russia has chosen not to join the West in freedom and prosperity, but rather to be a thug state the West will not admire or partner with. Expand NATO to Georgia and Ukraine. Restrict military sales to Russia. Restrict technology sales to Russia. Restrict Russian access to the Internet. 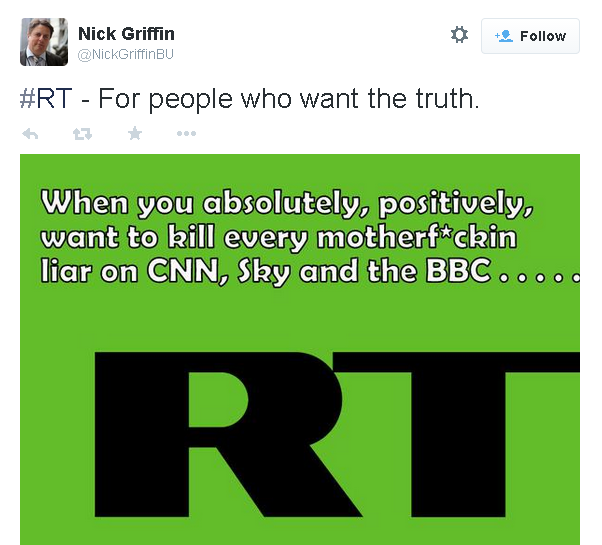 RT, Putin's propaganda TV, is endorsed by British fascist Nick Griffin. Says it all. Europeans settled there from the 1880s on. White rule ended in 1980. Unfortunately, Rhodesia / Zimbabwe then became worse, not better. The Matabeleland genocide in the 1980s. "Operation Drive Out Trash" in 2005. Land evictions and confiscations destroyed the economy in the 2000s. There were many reports of famine. Zimbabwe, the land of dying children, R.W. Johnson, The Sunday Times, 7th Jan 2007, tries to estimate how many people have died and how many people have fled the country. Mugabe is their darling - Aidan Hartley, 25 Oct 2003, criticises Africa's black upper middle class for defending Mugabe. What is it that makes us think that people outside the West are "wiser" than us? The sad truth is that people are stupid all over the globe. In 1970 there were 270,000 whites in Rhodesia. In 1980 white rule ended and Rhodesia became Zimbabwe. By 2000, there were only 50,000 whites left. Today there are only 30,000 whites left. 90 percent of whites are gone. Ethnic cleansing of wealthy minorities (Jews, Levantines, whites, Asians) is generally not a sign of a successful nation. America, under Bill Clinton, did nothing. Why? Because of Somalia. Clinton, Clarke and Rwanda: Ten Years On by Mark Steyn, The Irish Times, April 5th 2004 - on the failure of Clinton and Richard Clarke to stop - to even try to stop - the Rwanda genocide in 1994. "Bill Clinton knew about Rwanda and chose to do nothing. Why was this? Well, Somalia, of course." The UN, of course, did nothing. Why? Well, that's what they always do. Kofi Annan saw a genocide of black Africans happen on his watch (as head of UN peacekeeping forces), and did nothing. And a genocide of black Africans happens again in Sudan. And again, Kofi Annan and the UN do nothing. France actively supported the genocidal Hutu government. 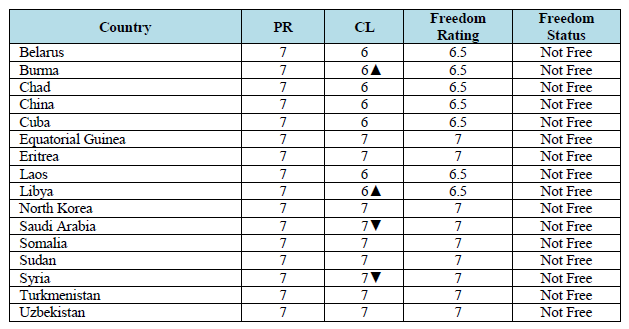 Rwanda is rated "Not Free" by Freedom House. 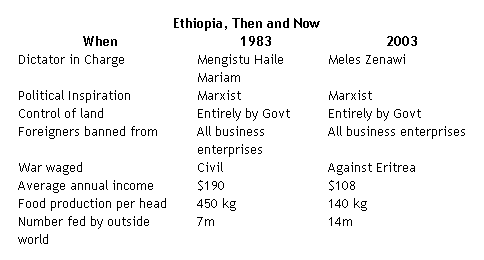 The modern Marxist famine - Tony Allwright, Jan 2004, points out some shocking facts about modern Ethiopia. Simon Mann was jailed in 2004 to 2009 for planning a coup against the regime of Equatorial Guinea. As if there's anything wrong with that. 2015 election. Small steps away from tyranny and towards democracy. Criticism of the King is banned in Thailand. The book The King Never Smiles, an unauthorized biography of Thailand's King, is banned in Thailand. "I went to Zwolle. ... There was a policeman in uniform, and I felt a sudden fear when I saw him, but he told me politely, "Our center is full, we're not taking any more refugees, but you can go to Zeewolde." He gave me a bus card and a train ticket and instructions for the journey. ... Police to me were oppressors, demanders of bribes. They were never helpful. I asked him "Why are you helping me?" and he smiled and said, "Those are the rules." I asked, "And is every policeman this kind?" and he replied, "I sure hope so." After this, anything was possible. To me, government was bad. It was crooked and duplicitous and it oppressed you. And here all these people were busy helping you and this for foreigners. How on earth did they treat their own clans?" - Ayaan Hirsi Ali, in her book Infidel, describes life in the unfree world, so alien to us, where the idea that the government and police might help you is utterly alien. "Colonel Gaddafi must understand that our country is not a doormat on which a leader, terrorist or not, can come and wipe the blood of his crimes off his feet. France should not receive this kiss of death." - Rama Yade, French minister for human rights, shows delicious disrespect for the vile dictator Gaddafi on his visit to France in Dec 2007. Sarkozy may have been angry with her in 2007 for attacking the visit, but she was proved right when Sarkozy himself started bombing Libya in March 2011! I hope he has apologised to Rama Yade. "Let's get rid of them all"
- Tony Blair on the regimes of the unfree world. He is responding to the "anti-war" argument on Iraq: "Why attack Iraq when there are so many other tyrannies?" Blair brilliantly calls their bluff: Yes. I agree. Let's do them all. Of course this is the last thing the "anti-war" people want! They want all tyrannies to be left alone. The left wants to leave tyrannies alone. I want all tyrannies destroyed, everywhere. This is why I am not a leftist.